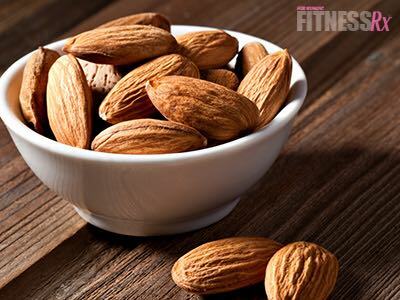 FitnessRX for Women > Nutrition > Healthy Eating Tips > Almonds! Almonds are my favorite nuts! They are very healthy and tasty— they contain vitamin E, folic acid, omega-3 fatty acids and fiber, just to name a few. And to lose fat, it is necessary to eat good sources of fat like almonds. However, the quantities are important because they are a high-calorie food. Just 1 oz. of almonds has 163 calories, 14 grams of fat (monounsaturated: 8.7 grams), 6.1 carbs and 6 grams protein. Help build strong bones and teeth. As a dentist, I know that almonds havephosphorus and calcium that have an important role in the bone and teeth structure. Protect artery walls from damage and lower “bad” cholesterol. “It was found that the flavonoids in almond skins work in synergy with the vitamin E, thus reducing the risk of heart disease,” according to research at Tufts University. In addition, almonds added to the diet have a favorable effect on blood cholesterol levels, according to a clinical study by Dr. Gene Spiller, Director of the Health Research and Studies Center, Inc. And people who regularly eat tree nuts like almonds have lower levels of cholesterol, according to an April 2011 report in Nutrition Reviews. Provide healthy fats and aid in weight loss. Eating “good” sources of fat helps to reduce fat, but the quality and amount of fat is important! Almonds contain riboflavin and L-carnitine. Carnitine has energy properties that are great for fitness goals. Scientists at Purdue University’s Department of Foods and Nutrition published a paper in the September 2008 issue of The Journal of Nutrition in which they reported that nuts eaten daily, in moderation, may boost adherence to a weight-loss plan due to the energy, satiety effect and palatability of nuts. Insulin effect. Combining carbohydrates and almonds reduces circulating levels of sugar in blood, according to a March 2007 report in Metabolism. This finding suggests that almonds might suppress insulin release!! Help provide good brain function. Almonds contain riboflavin and L-carnitine, nutrients that boost brain activity and may also reduce the risk of Alzheimer’s disease. They help increase intellectual level and longevity. They alkalize the body. Almonds are the only nut— and one of the few proteins— that are alkaline forming. This is very important to prevent illness, low energy, weight gain, etc. I love almonds because they have many benefits and are delicious! But remember that moderation is important!